Nearly a decade later and none the wiser | Be Nice. Since when did Islam equal terrorism? Well, if you watch the news lately, it does right now. No one is saying it, but what those who oppose a mosque near the World Trade Center site in New York seem to be implying with their objections is that a religion is responsible for the acts of a few extremists. These sentiments are bubbling with intolerance, bigotry, and ignorance, as well as a fear of being insensitive to the survivors and families of 9-11. I mean no disrespect for these victims, but I must question the logic in the mosque’s opponents’ arguments. Extremists attacked the World Trade Centers. And yes, they were Muslim. But are those two thing inextricably linked? No. I am of German heritage. Am I a Nazi? No. Do I hate Jews? No. Does the events of 9-11 indicate that every mosque is full of extremists ready to bomb American locations? No. 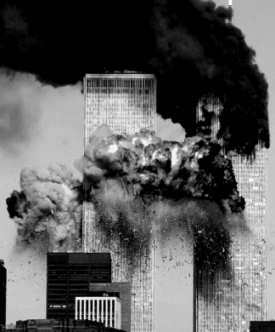 It makes me sad that nearly a decade after the terrible events of 9-11, people are holding prejudice for a religion, and its practitioners, due to the acts of a few individuals. My great-uncle (may he rest in peace) was a Catholic priest. Was he a child molester? No. But based on the assumptions made in people’s vehement protests against the mosque, I should assume that all priests are child-molesters and I should feel it would be a “slap in the face” to build a Catholic church near an elementary school. It just doesn’t make sense. And it makes Americans appear ignorant, bigoted, and judgmental. Aren’t we better than that? Aren’t we more enlightened? It was wrong and awful what happened to those people who died in the World Trade Center attacks and its aftermath. It is sickening what is still happening to those emergency response workers. But how is this reaction to the mosque going to support one of the founding the ideals of the United States: freedom of religion? How are we modeling the ideals of what most religions preach (including Jesus, and I am certain Mohammed as well): tolerance. An open mind. Forgiveness. I know this is a hot issue. And it is an emotional one. I’m not denying what happened in 2001 was absolutely devastating. It was. I can imagine how people could be feeling (a mosque towering over a site where so many souls perished, mocking their deaths, taunting the survivors…. ), and although I don’t feel that way myself I can imagine many do and I can empathize with their concerns. But the issue isn’t with the religion. It’s with the perpetrators of the crime. I have confidence that we as Americans can model the forgiveness and acceptance the world needs to see right now in order to become a more peaceful place. Let them build the mosque at ground zero, and show the world just how compassionate, forgiving, loving accepting, and open- and fair-minded America can be. This entry was posted in Perspectives on Be Nice., To Be Nice is to be Compassionate and tagged 9-11, 9-11 attacks, Ground Zero, Mosque at Ground Zero, New York mosque, World Trade Center by Jen. Bookmark the permalink.